Kathleen Petyarre was born circa 1940, at the remote location of Atnangkere, an important water soakage for Aboriginal people on the western boundary of Utopia Station, 150 miles north-east of Alice Springs in the Northern Territory of Australia. Kathleen belongs to the Alyawarre / Eastern Anmatyerre clan and speaks Eastern Anmatyerre, with English as her second language. Kathleen, with her daughter Margaret and her sister’s, settled at Mosquito Bore, on Utopia Station near her birthplace. Kathleen now spends part of the year at her residence in Adelaide. Kathleen’s mother and seven sisters have managed to hold onto their land near Utopia Station as a group, establishing a camp at Atneftyeye Boundary Bore. 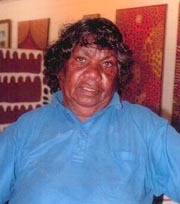 Kathleen was one of the key Anmatyerre women involved in the successful claim for the freehold title, which led to the 1979 formal hand-over of the Utopia pastoral lease back to its traditional owners. Kathleen’s inherited Dreaming stories from her father and mother are Mountain Devil Lizard, or Thorny Devil Lizard (Arnkerrthe), Women Hunting Emu, and Dingo (Atnangkerre) and all of her paintings directly refer to these "Dreamings" and the associated country around Utopia in the eastern central desert of Australia. A common theme of Kathleen’s paintings refer to Arnkerrthe, Mountain or Thorny Devil Lizard, (Moloch horridus) a small lizard which has spikes on its back and lives in the desert, crossing vast terrain and changing colour according to its environment like a true chameleon. The enormity of his journeys can be felt in the landscape of Kathleen’s works. This important clan country serves not only as a creation site, but a sacred place in which to reconnect with the Dreaming through ceremony, and in particular, initiation rites. Kathleen, continues to demonstrate her detailed, accurate knowledge and respect of country through her remarkable paintings that in turn give the viewer an insight into an ancient other world of endless beauty. Selected Exhibitions: 1989 Coventry Gallery, Sydney; 1989, 1997, 1998 Tandanya, Adelaide; 1990, 1991 Royal Hibernian Academy, Dublin, Ireland; 1990 Crawford Municipal Art Gallery, Cork, Ireland; 1990 Harvard University, Boston, USA; 1990, 1999 At Gallery of NSW, Sydney; 1992 Robert Holmes a Court Collection, Sydney; 1993 Moree Plains Art Gallery, Moree; 1994 Australian Embassy, Paris, France; 1994, 1997 Songlines Gallery, Amsterdam, The Netherlands; 1995 Ludwig Forum fur international Kunst, Aachen, Germany; 1996 Art Gallery of South Australia, Adelaide; 1996 Old Parliment House, Canberra; 1996,1998, 2000 Alcaston Gallery, Melbourne; 1996, 1998 Museum and Art Gallery of the Northern Territory, Darwin; 1996, 1998 Gallerie Australis, Adelaide; 1997, 1999 Gold Coast City Art Gallery, Surfers Paradise; 1997 Museum PuriLukisan, Ubud, Bali, Indonesia; 1997 National Gallery of Indonesia, Jakarta; 1997, 1998 National Gallery of Victoria, Melbourne; 1997 "Dreampower", Adelaide; Mary P;ace Gallery, Sydney; 1997 Coo-ee Aboriginal Art Gallery, Sydney; 1998 Chapman Gallery, Canberra; 1998 Virginia Beach, Virginia, USA; 1998 Museum of Contemporary Art, Sydney; 1998 Japingka Gallery, Perth; 1999 Art Gallery of Western Australia, Perth; 2002 Aboriginal Galleries of Australia, Melbourne; 2002 Gallerie Commines, Paris, France. Selected Collections:Paintings Collection of H. M. Queen Elizabeth 11 National Gallery of Australia, Canberra, ACT, Australia The Kerry Stokes Collection, Perth, WA, Australia. The Museum & Art Galleries of the Northern Territory, Darwin, NT., Australia. Art Gallery of South Australia, Adelaide, S.A. Australia; Flinders University Art Museum, Adelaide, S.A. Australia; The Kluge-Rhue Collection, University of West Virginia, VA, USA; The Kelton Foundation, Los Angeles, CA., USA; The Levi-Kaplan Collection, Seattle, WA., USA; A.T.S.I.C. Collection, Adelaide, S.A. Australia; National Gallery of Victoria, Melbourne, Vic. Australia; Museum Puri Lukisan, Ubud, Bali, Indonesia; University of South Australia Art Museum, Adelaide, S.A. Australia; Riddoch Regional Art Gallery, Mount Gambier, S.A. Australia; Edith Cowan University, Perth, W.A. Australia; Collection de Musee des Arts d’Afrique et d’Oceanie, Paris, France; Peabody - Essex Anthropology and Ethnology Museum, Harvard University, Salem, Mass., USA.